Stratton Men's Cedar Shoe Tree (Large) | What Should I Say? Our full toe is our best selling wooden shoe tree, featuring its two part ventilation slots at the toe, which is recommended by most fine shoe manufacturers. Use of our shoe trees is the ultimate way for a gentleman to protect and extend the life of his shoes. 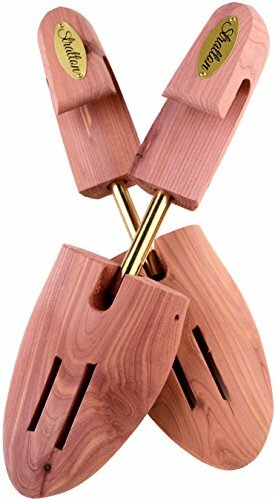 Made from the aromatic heartwood of premium red cedar, these shoe trees work their magic by absorbing the odor and moisture into the wood, and then allowing the moisture to escape through the two ventilation slots. They preserve the original shape of the shoe by our gentle spring loaded technology. Our award-winning Top Rated status is testimony to our integrity of quality and design, by thousands of worldwide customers year after year. Top Quality - Premium Red Aromatic Cedar Wood Shoe Trees protect the leather, fabric, stitching and soles from moisture damage. Crisp Cedar Smell - Manufactured to optimize a long lasting cedar aroma, while preventing natural odors from developing. Great Shoe Shaper - Shoe trees are known to maintain and preserve the original shape and form of your shoes, as well as preventing wrinkles from appearing. Adjustable - Integrated spring coil centerpiece provides just enough light tension to fill your shoes while firmly maintaining the length. Great Gift - Long lasting shoe trees are a timeless necessity that every gentleman will use, making it a great gift with its elegant gold branded nameplates. If you have any questions about this product by Stratton, contact us by completing and submitting the form below. If you are looking for a specif part number, please include it with your message.